Welcome to Best Juicer Ratings & Blender Reviews where you'll find unbiased ratings on over 150 top juicers and blenders. You can also view in-depth blender and juicer reviews that highlight the pros and cons of each appliance. Our goal is to help you find the best-value juicer or blender that meets your personal needs and budget. If you want to lose weight or simply live a healthier lifestyle, juicing is a fun, tasty way to get the nutrients your body needs. The average person should have 2 cups of fruit and 3 cups of vegetables each day according to the CDC (Centers for Disease Control). Juicers and blenders can help you meet this important goal by packing several servings into one taste-tempting smoothie or yogurt shake. Only juices citrus fruits such as oranges. Manually hold fruit against spinning reamer. Least expensive juicer, many less than $50. Often messy to use, but easy to clean. Juices most fruits, vegetables, no grass. Most common and popular type of juicer. Quickest and easiest to use and clean. Look for a pulp ejector and longer warranty. Fruits, vegetables, leafy greens, wheatgrass. For serious juicers wanting max nutrition. Low RPM creates less heat and oxidation. Time-consuming, expensive, harder to clean. Similar to masticating, except 2 gears. Many use magnets for enriched minerals. Most expensive and hardest to clean. What's the best juicer to buy? Breville, Jack LaLanne, Omega? See our complete juice extractor ratings on centrifugal juicers, wheatgrass juicers, citrus juicers and more. Compare centrifugal juicer ratings and read reviews on Lalanne, Juiceman, Breville, and more power juicers. Find the best citrus juicer for your money. Compare ratings and read reviews on Black and Decker, Waring, Oster, and more juicers. Find out which masticating juicer is best. Read reviews and check ratings on Omega, Champion, Samson, and more juicers. Don't buy a twin gear juicer until you check our ratings. Read reviews and compare ratings on Green Star and Samson triturating juicers. How does the Black and Decker juicer compare with other brands? See our ratings and reviews on Black & Decker's citrus juicers and more. See our Breville juicer reviews and find out why they are rated so high compared to their competitors. View ratings on all Breville juicers. Which champion juicer is best? See our juicer ratings and compare Champion with other top juicers from Omega and Samson. Compare the Green Star juicer with other top brands. See our ratings and reviews on the Green Power Gold and 1000 - 3000 models. The Hamilton Beach juicer is a good value for your money. See our ratings and reviews on the Hamilton Beach Big Mouth juicer and Smart Health juicer. Compare Jack Lalanne juicer reviews with Juiceman and other top juicers. Check juicer ratings and read reviews before you buy. Juiceman juicer or Jack Lalanne juicer? Compare ratings and reviews of these popular juicers with other top brands such as Breville and Omega. See our L Equip juicer ratings and reviews. Compare ratings on the L Equip 215 and L Equip 110.5 versus other top brands. Is the Omega juicer or Breville juicer rated higher? Compare top juicer ratings and read juicer reviews. Is the low-cost Oster juicer or Black and Decker juicer a better value? Check our juicer ratings and reviews. How does the Samson juicer compare with Omega, Champion, and Green Star? See our ratings and reviews of these top masticating juicers. Which Waring juicer is best? Check our ratings and reviews on the Waring Pro Juicerator and see how it compares with other top brands. Read our best blender reviews and check the ratings on over 60 top blenders including Vitamix,Blendtec,Waring,Oster and more. Compare our Jack LaLanne juicer reviews and ratings with other top brands. See our ratings on the Jack LaLanne Power Juicer. See our Breville juicer reviews for ratings and analysis of the top Breville juicers. 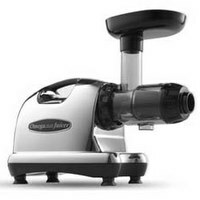 Compare Breville juicers with Jack LaLanne, Omega, and more. Compare our Champion juicer reviews and ratings with other top juicers such as Omega and Samson. Find out which masticating juicers are rated highest. See our Juiceman juicer reviews and compare juicer ratings with Jack LaLanne, Breville, and other top juicer brands. See our Green Star juicer reviews and find out how they compare with other leading juicers such as Omega.